Nuclear Option Š 11-29-2013 Š Raging Pencils Š Radioactively Progressive Comics Monday, Wednesday and Friday! Free comics every Monday, Wednesday & Friday! Looking for a specific Rage comic and/or Rant and can't find it? All the Way Down, Turtle. The Republican Party has recently been floating the idea that the phrase "nuclear option" was a Democratic invention but it was actually coined by former Senate Majority Leader Trent Lott back in 2003 during a lengthy filibuster over a Bush appointee for the federal bench, one Miguel Estrada. Mr. Estrada refused to answer the questions of several Democratic Senators so they refused to appoint him. By 2005 Republican Senator Mitch McConnell began raising a stink after a handful of Bush appointees were snubbed,stumping for the GOP to make the very change in filibuster rules that the Democrats just applied, the famous "nuclear option". For various reasons, Senate Leader Bill Frist chose not to pull the trigger at that time. I'm not doing back flips over Senator Reid's maneuver as I think it could be trouble in future depending on how many billions of dollars the Koch brothers will dump on Republican and Tea Party Senate candidates. Cross your finger and buckle up 'cause it's going to be a bumpy ride. Note: Sorry for the quickie photo-toon. Thanksgivingtime is always harsh on comic deadlines, but I'm happy with the result. See you Monday, kids. Speaking of the Pilgrims, here's an entertaining look at the early colonizers of America. 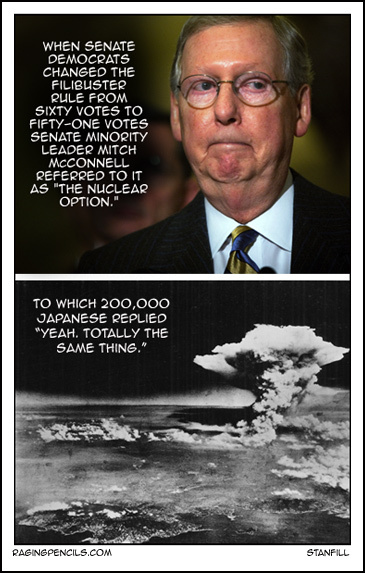 When Senate Democrats changed the filibuster rule from sixty votes to fifty-one votes Senate Minority leader Mitch McConnell called it "The Nuclear Option." 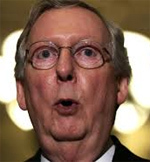 To which 200,000 Japanese replied "WTF, Turtle Man?"